At the Free Library, we recognize that people come to literacy—and literature—in many different ways. In our Words at Play Vocabulary Initiative, art, music, and other unique tools are used to help increase the vocabulary of Philadelphia’s pre-k kids. In our Culinary Literacy Center, visitors of all ages approach literacy through reading recipes—and making some delicious dishes along the way! And we even bring furry friends into the library on occasion to create a safe space for children to read to non-judgmental (and oh-so-cute) therapy dogs. One of the aspects I love most about One Book, One Philadelphia is that it brings people together over a single piece of literature through myriad routes just like this. We offer cooking programs, art workshops, musical performances, panel discussions, and so much more to engage the public during our two-month long program period. This week I had the opportunity to actually touch pieces that are connected to this year’s featured selection. The Curious Incident of the Dog in the Night-Time is a mystery novel (Or at least, I’ve argued that it is! ), and so our partners at the Rosenbach hosted one of their beloved Hands-On Tours, with this one focused on “Sleuths and Spies,” in honor of the theme. Hands-On Tours are all built around a common theme (other offerings include, for example, "James Joyce and Irish Authors" or "Shaping Shakespeare") and allow participants to hold and interact with items from the Rosenbach’s rich and historic collections. During my "Sleuths and Spies" tour, I was able to flip through a serialized copy of Charles Dickens’s The Mystery of Edwin Drood from 1870; hold an early compilation of Sherlock Holmes stories, which included the short story "Silver Blaze" from which the title of The Curious Incident of the Dog in the Night-Time is drawn; and even handle a forged letter once thought to be from Edgar Allan Poe. The history and literature nerd in me just loves the idea that I not only get to see these amazing artifacts, but I get to touch them, feel them, and really inspect them up close. But this is what makes the Free Library and its programs like One Book so powerful: They allow us to connect with literacy and literature in whatever different pathways spark our curiosity, uniting us all in one common conversation. 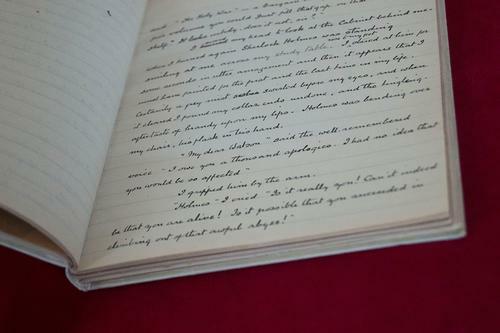 Arthur Conan Doyle's handwritten copy of "The Empty House," the story in which Sherlock Holmes reappears after being presumed dead.